INDUSTRY.co.id - Jakarta - Although there is a tendency to weaken the purchasing power of the public, but it did not affect the property market. The secondary property market is still considered to enjoy growth during the first semester of 2017. The increase in secondhand transaction is reflected in the transaction record at Properti123.com. 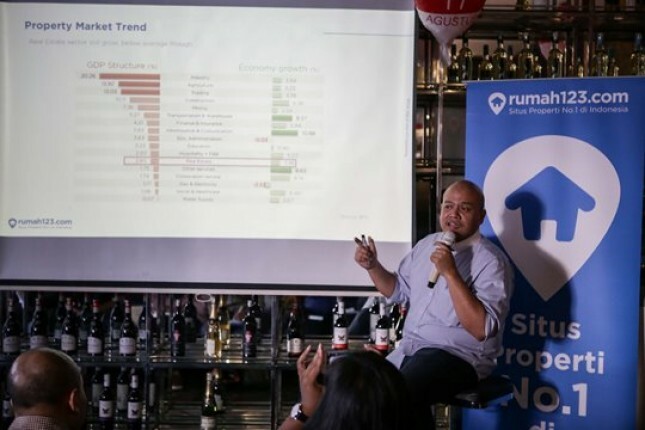 Country General Manager of Rumah123.com, Ignatius Untung said, there is a lack of news that mentions the purchasing power of the people down with data owned Rumah123.com which recorded a growth in property sales. "This is reflected in the increase in house search on our site good, new product listings and quantities sold," said Untung, last weekend. Search trends on Rumah123.com website in the first half of 2017 increased 48.3% in the same period last year. Meanwhile, if you look at the performance of the second half of 2016 search on this site on an increase of 64.95%. Data Rumah123.com shows that searches in Bintaro, Kelapa Gading and Bumi Serpong Damai (BSD) make these three areas a favorite area. As for the non-Jabodetabek area, namely Antapani Bandung, Citraland Surabaya and Dago still superior. Not only from searching, mortgage submission also looks increasing with the trend is also interesting. The mortgage application is dominated by the age of 30-39 years. Approximately 46.8% of mortgage applicants are in the age range, of which 16.47% of them earn Rp 5 million-Rp 9 million per month. With the average income, the most targeted credit ceiling maximum 250 million. The next position is still occupied by consumers in the same age range but has an income of Rp 10 million-Rp 19 million. The credit ceiling targeted by this group is Rp 250 million-Rp 500 million. Interestingly, there is a trend that makes a large income investing in middle-class properties. At least 5.72% of consumers who earn above Rp 50 million per month also apply for credit with a maximum ceiling of Rp 250 million. "There is anomaly in the salaried segment of Rp 50 million and above" said Untung. The identification of an increase in property transactions is also seen from sold listings. The average growth of sold list per month for rental and selling properties since the second half of 2016 until the first half of 2017 reached 7.4%. Especially for property selling, the average growth of 6.6%. So what's wrong with purchasing power?